This week we will be talking about how self-control is so important to our teaching and parenting! Self-control is an attribute that ties into all of the other Fruit of the Spirit and can totally change the way we teach and parent! You don't want to miss this final course! Just click HERE to listen or the play icon on the radio widget below for the introduction and all the details. Make sure to open a separate page while you surf around. We were inspired by this adorable Fruit of the Spirit Teacher Poster from Mrs. Mabe. Here is an adapted version that includes this entire 7 week's course verse - Galatians 5:22. Plus, we've added a version for homeschooling parents. It's a visual reminder of the scripture for this course and how you can apply it each day with intention to your teaching life. 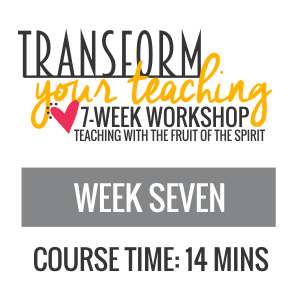 We love that you took this challenge to transform your teaching right along side with us over these seven weeks. 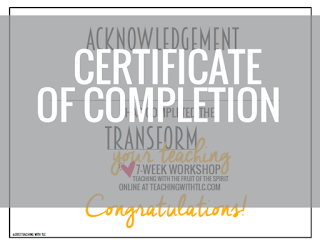 This printable certificate is a fun way to congratulate yourself for living life with intention and moving towards being the best teacher and/or parent you ARE intended to be!